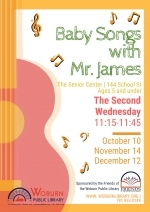 James Lepler is back with his guitar to entertain you and your children! Join us at the Senior Center (144 School Street). Ages 5 and under are welcome. Thanks to the Friends of the Library, these programs are free and open to the public. Cancelled in inclement weather.